Beautiful are the rivers of people in the streets of Egypt. The Arab Spring of democracy has already brought to flower new practices of liberty in public space. The heroic, resolute, peaceful youth has offered more than 300 martyrs from among their ranks to secure for all Egyptians freedoms they themselves lacked. Standing firm in the face of lethal force, the martyrs de-legitimise the police state both legally and politically. In each place that they fell grows a seed of the future. The authority of the stick has been broken. It is no longer respected to give orders. The revolt begun by the Facebook youth on 25 January became a revolt of all the youth on 26 January, and a revolt of all society three days later. An unwritten social programme is agreed upon and embraced by all: building a sovereign democratic welfare state. When we drafted our article “The Arab Spring of democracy” (Ahram Online, 18 January 2011), sensing an imminent Arab revolt, for various reasons we had Egypt in our minds. Egypt is the heart of the Arab world, the largest Arab state and the most advanced in many domains. While Tunisia and Egypt have common traits, they also have differences; Egypt was and remains the Arab state essential to facing Israel, with which it was at war on several occasions, resulting in a popular army and institutions of an army that are respected by its people. We heard the 25 January call for protest and we saw the success of its mobilisation. Since then we decided not to write, aware that the Egyptian movements themselves would decide the success of their revolution. As we said in our previous article, this revolution is different: it heralds a new kind of revolution in Arab and Third World countries. Already, many articles have been written about the Egyptian revolution. The majority have employed either non-applicable criterion taken from other revolutions to understand its nature and to portray it, or have attempted to hijack it or to give lessons to the Egyptian people. This revolution has its own dynamics, but it also sheds light on the wider Arab revolution. Its first significance is that it is a pacific revolution. Neither theoretically nor practically do the Egyptian people advocate for the use of violence to achieve political ends. There are no traces of the rhetoric of civil war, armed insurrection or appeals to use force. On the contrary, it is the counter-revolution, orchestrated by the state, which has resorted to violence and intimidation, and which failed to break the revolt. The people stand united with the army, knowing that the sons of Egypt, conscripted from every family, defend Egyptians and not a regime. Meanwhile, the pacifism of the youth doesn’t mean that it does not defend itself and its revolution and peoples rights against the violence and provocations of the state. The more the state used violence, the more the youth stood resolute and the ranks of the demonstrations grew and spread to all sections of society. Its second significance is that contrary to the leftist literature advocating a policy of tabula rasa in order for revolution to succeed, the revolutionary Egyptian youth is proud of its history, its country and state, including its army. What we hear in their slogans, literature and discussions is a call to change the state into a democratic welfare state, rather than to destroy the state apparatus and its institutions. Many factors lead to this equation. The first resides in the extent and complication of the modern state’s role in everyday life. Second, Egyptians are aware that the intertwinement of international trade with the national economy would make the isolation of Egypt for a long period of time an economic disaster. All also know the necessity of standing ready to defend the country against potential external aggression, Israeli or any other. The third significance of this revolution resides in the absence of a culture of avant-gardism. We do not mean that there are no groups and individuals who paved the way for this revolt by their actions on the cultural scene. But none of them advocate for a putsch to reach power and implement what they would believe is the best for the people. One reason for this leaderless phenomenon is linked to the impossibility of constituting a singular avant-garde under the regime’s repressive policies, and the ease any attempt would offer to power in decapitating this “leadership”. This difficulty of having an avant-garde turned into an advantage as the revolution became easily adopted as their own by all sections of the population. The longer it has remained leaderless, the more exposed has been the total confrontation between the people and the regime. We are impressed by the largeness and spontaneity of the participation, whether in numbers, classes, genders, or political sympathies, while those who called for 25 January were few. Their demands have proven to be the demands of all the people. Through practical and realistic slogans, understandable by anyone, they demand real democracy and social justice. Through this process, the Egyptian people accomplished — with neither avant-gardism nor ideology, nor a large organisation — a collective thinking and carried forward actions that equate to a whole people in revolt. We now know that in Egypt the two pillars of what we call the Third World state in a globalised world, based on a police state and a comprador class allied to international capital, has failed or at least lost all legitimacy. What will be built in the future, we think, depends on the consciousness of the Egyptian national movement and its determinations. The past 16 days proved the high consciousness and political maturity of the people. Already the potential divisions between secular and religious, Muslims and Christians, nationalists, leftists and Islamists, the poor and the middle class have instead, in unity, become the movement’s strength in diversity. The attempt by the counter-revolution to use force and to incite violence and divisions among the people has failed totally and will fail as long as the revolution adheres to its nature. The attempt to divide and conquer by alleging that this or that group is trying to take over is faced by the insistence of the movement, in its slogans and practice, that they don’t want to jump on the back of power. On the contrary, they insist that democracy and freedom should be for all. The democratic change in Egypt frightens all in the West, and especially Israel. This alarm does not come from a threat of direct economic or military confrontation, but rather from the waking of the Arab world and the results implied by Arabs having a democratic state that defends the interests of the people. If Egypt becomes democratic, Israel loses the dream of dividing the Arabs in order to control them. It would also break the myth that Israel is the only state in the region capable of democracy. No wonder Israel regrets the collapse of the old structure, though it can do nothing about it. The Egyptians opened their mouths. This will be an ever-evolving phenomenon of expression and quest for their rights. Apart from defending Egypt’s security, rights, and the culture of Arab solidarity, no current from within the revolutionary movement expresses a tendency to wage war against anyone. The Egyptians do not pretend that they will change the world order. They express the necessity of having relations according to mutual benefits. They do not lay claims to lead the Arab world either, though they know the importance of Egypt in the Arab world. No one thinks that terrorism will produce change or that without the state (as defended by leftist revolutionaries) and its institutions Egypt can defend its own people and land, or even this revolution. Many different rumours are being spread in various quarters, alternatively saying that Iran, the Muslim Brotherhood, or even the Americans are behind this revolution. Their purpose is to make the Arabs lose confidence in their own capacity and unity in change. Some, including Khamenei, tried to say it is Iran’s influence and example that touched the Egyptians, including exaggerating the role of the Muslim Brotherhood in the revolution. It is true that the Iranian revolution was popular, but it resulted in a religious oppressive state, in spite of being anti-imperialist. The Egyptian revolt is for a democratic state not a religious oppressive state. Many Egyptians consider the appeal to use violence and religion propaganda in speaking of their revolution as serving the counter-revolution. While the Egyptians in their literature consider the Muslim Brothers as one of the national groups, the majority in Egypt — as is made clear from the people participating in this uprising, their slogans and their expressions — are opposed to the concept of a religious state and to the use of violence. The reasons that the Egyptian revolution does not herald a religious state are multiple, including the specificity of Egyptian Islam, which in general is not directly political, the largeness of the secular middle class, the aspirations of the youth for increased individual liberties, the animosity of the army towards a religious state, coming from past confrontations, cultural competition in matters of democracy due to Egypt’s geographic belonging to the Mediterranean basin, and its economic reliance on being an attractive tourist venue. Even the Muslim Brothers themselves declared that they participate with others and do not encompass this uprising of the people. Whatever is the immediate outcome on political power and its structures, the Egyptian revolution has already imposed the liberty of expression in society, imposed the necessity that change for all should go in the direction of defending sovereignty, public property and riches, and to use the state to realise social justice and solidarity. This is an expression of a deep culture in Arab countries and its principle of solidarity. Solidarity expressed in the terms “We love Egypt and we protect it” is in modern political thinking called the welfare state. No one can know the immediate pace and the extent of change, for there are many trends in the state apparatus and many trends in the revolutionary movement. But all know there will be no viable power if they don’t work towards a welfare state. The ignorance of Western think tanks hoping that a police state with a comprador class can repress the will of the people indefinitely is well portrayed by their surprise when this state model could only resist three days in the face of a popular uprising. In their analysis of the situation, some Western sympathisers with Egyptians share the same ignorance of the Egyptian situation and the conditions for 21st century revolutions as they apply a culture dating back to the 19th century. Although they accept the May 1968 principles of ecology, human rights, freedom of expression and individual liberties as normal in the West, they apply to Arab revolutions a kind of putschist conception of the revolution, and worry from the beginning of the Egyptian revolt about the lack of identified avant-garde leaders. Egypt is a developing country but it is a modern country whose youth, which constitutes 60 per cent of the population, is as educated as their counterparts in Western countries. It is certain that there is large poverty and class differences in Egypt, but the middle class is as large as in Europe and suffers in the current neoliberal globalisation-driven financial crisis from the same deteriorating conditions while aspiring to the same opportunities and freedoms. The difficulty for the Egyptian movement resides in how to navigate the change from a failed comprador state to a welfare state, while refraining from destroying the economy and state institutions. All are conscious that if they destroy the economy there will be no opportunity for building a welfare state. They defend change accepted by all walks of life and sections of society, through conviction and consensus. Time and balance of forces work for the revolution. The Arab Spring of democracy was born when all public affairs began being discussed in public. The persistent insistence on the departure or non-departure of President Hosni Mubarak by Western media is staged to judge if the revolution has succeeded or not. This is a way to drain the revolution of its real content, wherein they gained what they wanted and their demands are already accepted by all, including the collapse of the concept of inheritance of power and the de-legitimisation of the continuity of the same structure and policies of the state. If protesters continue to speak of Hosni Mubarak’s departure it is not his person that is important, but rather the symbolic guarantee that things change. Only Egyptians can decide what they accept or not. This is one of the grandeurs of the Egyptian revolution, because it follows its own dynamics without influence from obsolete examples. If the French produced the French Revolution of 1789 and the Commune of 1870, and became the example for revolutionary literature, and the Russians produced the October 1917 Revolution, the Arabs will give to the world and the Third World the example of the first half of the 21st century, by its pacifism, anti-avant-gardism, anti-neoliberal globalisation, and defence of the welfare state, national dignity and sovereignty. Abdul Ilah Albayaty is an Iraqi political analyst. Hana Al Bayaty is an author and political activist. 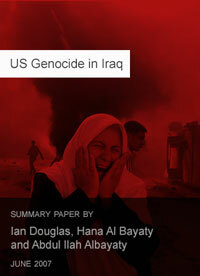 Ian Douglas is coordinator of the International Initiative to Prosecute US Genocide in Iraq. All are members of the BRussells Tribunal Executive Committee.